Built atop of a small green hill in Kiotari, on the southern coast of the island of Rhodes, the 4-star Princess Sun Hotel offers excellent sea views, as well as a magnificent view of a natural forest. It is located at 800 meters from a coarse sandy beach, 15 km from the cosmopolitan village of Lindos, 5 km from the traditional village of Asklipio and 54 km from the city of Rhodes. 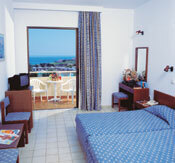 The hotel was renovated in 1997 when new superior rooms were built. All 147 guestrooms are appointed with modern amenities for maximum comfort, including double or single beds, air conditioning, Satellite TV, music channel, mini fridge, safe deposit box, direct-dial phone, bathroom with bath/shower, hair dryer and a balcony or terrace. The Sunset Main Restaurant serves a rich buffet for lunch and dinner. The Sunrise Pool Snack Bar serves a variety of drinks, snacks and light meals, while at night guests can relax over drinks and cocktails at the Sunbeam Main Bar which features an evening entertainment program. Other facilities include outdoor pool, billiard, table tennis, fitness room, darts, super market, children’s pool, sauna, mini club, shops, parking, gym, babysitter, kindergarten, TV saloon, 24-hour doctor, Internet, car rental and beauty center. 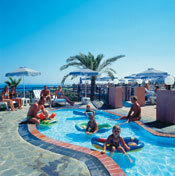 Mini-club activities are held daily at the nearby Rodos Princess Hotel. The hotel has a wealth of sport facilities including tennis courts, beach volleyball, basketball, water polo and motorized water sports. 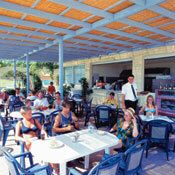 A traditional Greek evening is offered on a weekly basis with live Greek music and folklore dancing. The hotel’s entertainment team organizes sport activities during the daytime for guests’ entertainment.